The Avalon Air fryer promises to give you the same healthy and oil-free, delicious and crispy food that you will get from other air fryers but at a much more affordable price. This Air fryer is capable of cooking exclusively with very little or actually no oil. Consider the fact that the major fat content in foods is contributed by oil, the Avalon Bay Air fryer is capable of reducing your fat intake by as much as 75%, so much for so less considering the fact that this machine retails at a very affordable price. 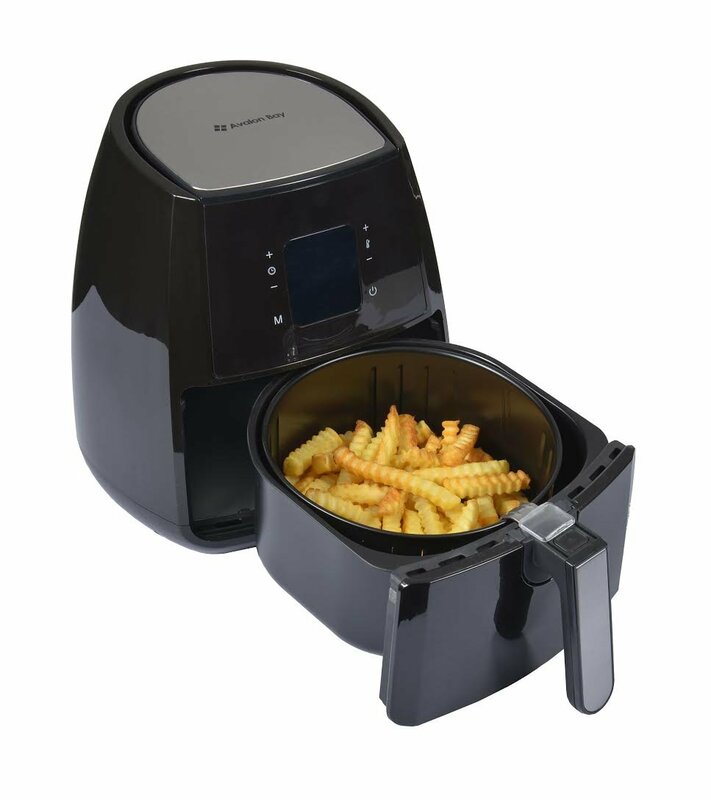 The AB-Airfryer 220SS technology uses Rapid Air Circulation to speedily circulate hot air around foods to fry or cook completely without oil, resulting in a healthier and delicious crispy food. 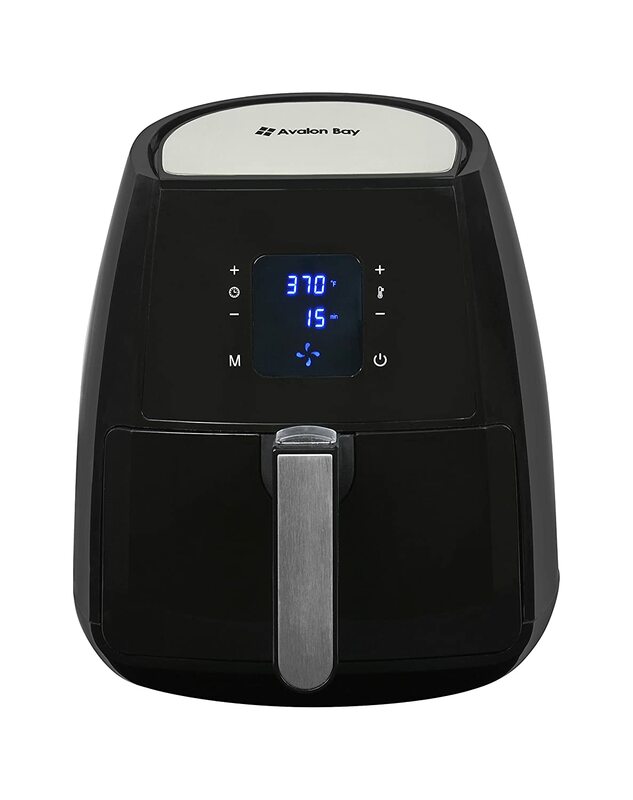 The Avalon Air fryer is made exclusively from 100% BPA free plastic and features non-slip feet for suction and stability. It has a capacity of 3.7 quarts and a temperature range between 200F to 400F. This affordable air fryer comes in a black color and a full-plastic exterior. The package weighs about 14lbs and measures around 15 x 14.7 x 15.5 inches in dimension. The Avalon Bay Air fryer comes loaded with a few accessories with which it is possible to perform other cooking methods apart from the primary air frying. We’ll definitely explain more of this as we go further in this Avalon Air fryer review. While there are enough air fryers in the market already, this gently-priced air fryer may be your best alternative to deep frying. With the low price, it is able to basically do what most of these pricey air fryers can do. It is fairly versatile and packs with it modest features that will completely simplify your cooking and eating experience. What could be better than getting that same delicious and crispy oil-free meal at a reduced price? So if you still find yourself asking this question, just remember that this air fryer is offering premium quality for a decent price. The Avalon Air fryer is fully loaded with some eye-catching features. It would be fair to say our Avalon Air fryer review is based on this, let’s check out the great features that this incredibly priced air fryer has to offer. The Avalon Air fryer has a capacity of 3.5 liters(3.7qt), that would easily feed a family of 4 to 5 people easily in a single batch of cooking. This technology is the basis of operation of the Avalon Air fryer. It works by circulating heated air around the food to be cooked, at a very high speed. This technology ensures optimal and even distribution of heat to ensure a perfectly cooked, even, and delicious final food result. Even though you may want to spray a little oil on your food before cooking, it is not like the air fryer cannot completely cook without any additional oil. It is capable of giving you delicious results in the form of a crispy outer layer and a moist, juicy interior. This ensures you get a food with a highly-reduced fat content, with still the same great taste without a compromise to your medical and physical wellbeing. A lot of features were integrated into the Avalon Air fryer to achieve this. The AB-Airfryer 220SS by Avalon has a handle that is always cool throughout your cooking session. The air fryer also has a removable drawer, with non-sticky, dishwasher safe parts. Add all these to an easily navigable digital touchscreen control and you’ll see that using an air fryer can never get easier than this. The air fryer is digitized and has an easily navigable interface guaranteed to give you a painless and stress-free experience. You have the flexibility of choosing between a temperature range of 200F to a high 400F to guarantee perfect and even cooking. The heating element is powered by a high 1400 wattage power. The air fryer may need some other accessories for you to achieve optimum use in some cooking areas. All of these accessories are available on Amazon, you just have to confirm if they would fit in your fryer before purchase. A detailed recipe book of 52 pages. Put it back in and punch in your settings. After a few minutes, a healthy and delicious meal is ready. To clean, you can just remove the dishwasher and non-sticky parts and clean with a little water. It doesn’t get so messed because there is not much oil involved in cooking. The air fryer is fairly versatile. The air fryer does not need pre-heating to start air frying. It provides you with an opportunity to eat safe and healthy oil-free foods. It has a great and affordable price tag. It is safe to use due to features such as auto timer and non-slip feet. The plastic material in the exterior may lose its coating after a while. There is no user manual but you can easily understand the workings after a few trials. Verdict – If you are seeking to buy an air fryer that combines quality and affordability, this Avalon Air fryer, AB-Airfryer 220SS offers you the best opportunity. It comes with decent features and is a sure bet to safe, delicious and crispy foods, without bringing any harm to your health, without bringing any harm to your budget. Air fryers are here to stay. They should top every concerned healthy individual’s shopping list. While they are very beneficial, they may be priced proportionally out of reach to an average person. The Avalon Air fryer solves this problem and does a very good job of it. I’m sure this Avalon Air fryer review has been helpful to you, this amazing product has gained a lot of hearts because of its affordable price, purchasing this air fryer would ensure you get to eat all those delicious foods you love without a risk to your health as well as your budget.